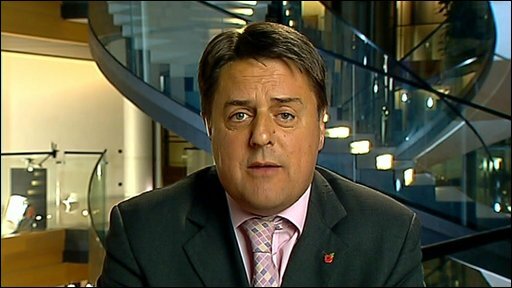 BNP leader Nick Griffin has criticised four former military leaders who have complained about "extremists" hijacking British military symbols. The four put their names to a letter saying the forces' reputation is being tarnished by right-wing groups. Comparing them to Nazi chiefs who faced trial at Nuremberg, Mr Griffin said the group had pursued "illegal wars". He later told the BBC it had been "black humour" but the Tories said his comments were "absolutely despicable". The BNP has been using military symbols, including a picture of a Spitfire alongside the words "Battle for Britain" which featured in the party's recent European election campaign. On Tuesday the commander of the Desert Rats in the first Gulf War, Major-General Sir Patrick Cordingley, former Chief of Defence Staff Lord Guthrie and two other former army chiefs, Generals Sir Mike Jackson and Sir Richard Dannatt, put their names to a letter. They wrote: "We call on all those who seek to hijack the good name of Britain's military for their own advantage to cease and desist. "The values of these extremists - many of whom are essentially racist - are fundamentally at odds with the values of the modern British military, such as tolerance and fairness." The letter did not mention the BNP by name, but General Sir Mike Jackson told the Times: "The BNP is claiming that it has a better relationship with the Armed Forces than other political parties. "How dare they use the image of the Army, in particular, to promote their policies? These people are beyond the pale." But he told the BBC it was not a "party political issue" but was about the reputation of Britain's armed forces. And Lord Guthrie later told the BBC: "The BNP are the ones probably uppermost in our minds - but all extremism in the armed forces is a bad thing." The letter was published as part of new anti-BNP campaign group Nothing British, headed up by ex-Ministry of Sound managing director James Bethell and Conservativehome editor Tim Montgomerie. Mr Griffin said it was being "organised by the Conservative Party which used to take the votes of the armed forces for granted". He claimed most "young squaddies" were now voting for his party instead. And in a long statement on the BNP website, under the headline "At Nuremberg, they hanged the politicians and generals for war crimes", he hit back at the military figures who had signed up to the letter. He said at the Nuremberg trials, Nazi political and military leaders were charged with "waging aggressive war". He added: "Sir Richard and Sir Mike fall squarely into this bracket and they must not think that they will escape culpability for pursuing the illegal wars in Iraq and Afghanistan." He also accused military leaders of saying nothing about the MPs' expenses scandal when the Army was "being underfunded". Later he told the BBC's political editor Nick Robinson it was "a little bit of dark black humour" and the generals had been "having a go at me all day". He accused them of being "intimately linked" with the Conservative Party: "They have made the decision to play rough politics so they can have some rough politics back." The BNP said it would keep using images like the Spitfire and Britain's wartime leader Winston Churchill in its campaigns. In the past, Mr Griffin has said he is campaigning for British veterans, regardless of their ethnic origin. He has also refused to stop wearing a poppy despite the British Legion asking him to do so. The BNP statement on Tuesday went on to claim Mr Griffin was wearing a poppy because he was asked to do so by injured soldiers at the Birmingham Selly Oak military hospital. He said was asked to do so to help highlight the fact that soldiers there were being "charged money to watch television despite being bed-ridden while recuperating". But the Ministry of Defence said the claim was untrue. A spokeswoman said the patient welfare fund at the hospital paid for TV cards for the soldiers, who were given a £10 card every three days. She said pay-as-you-go internet access was also provided to military patients on request. "If a military patient has any reason to pay for TV cards or [internet access] out of their own pocket, they are reimbursed," she said. Meanwhile Welsh Secretary Peter Hain has appealed to the BBC Trust to stop Mr Griffin appearing on Question Time on Thursday. He argues that the BNP is illegal because it does not allow ethnic minorities to join but BBC director general Mark Thompson has rejected that argument. But Lib Dem home affairs spokesman Chris Huhne said: "Refusal of Griffin on these grounds would look like gerrymandering, and would play into precisely the 'us against the establishment' pose that Griffin likes to affect." As well as Justice Secretary Jack Straw, the other Question Time panellists are expected to include Conservative peer Baroness Warsi, Lib Dem home affairs spokesman Chris Huhne and playwright and critic Bonnie Greer. Who's afraid of the BNP?